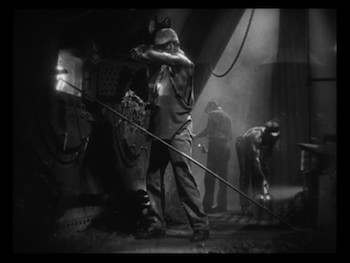 * Underworld (1927): This early gangster picture was built off a story by Ben Hecht, with a little doctoring by Howard Hawks, the guys who would eventually make the genre-defining Scarface. Underworld precedes that film by five years, but it actually plays a little fresher than its more famous descendent. George Bancroft stars as the corpulent crime boss Bull Weed. Just think about that name for a second: he's a deadly, oversized animal whose presence in a healthy area strangles the life right out of it. Underworld opens with Bull robbing a bank by basically blowing it up, setting the stage for his getaway. He's a larger-than-life figure in a larger-than-life city--though ostensibly Chicago, it's also a place called Dreamland. 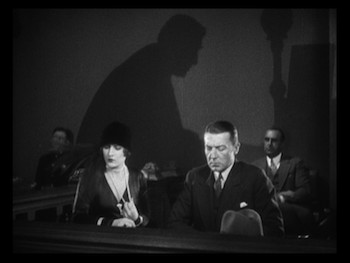 It's a landscape with dark corners, and von Sternberg's use of its unnatural shadows would greatly influence film noir. * The Last Command (1928): The great German star Emil Jannings (The Last Laugh, Faust) stars as a former Russian general, Grand Duke Sergius Alexander, who has been exiled to Hollywood following the 1917 Russian Revolution. Sergius has taken to movie acting to make money, and as fate would have it, his first assignment is playing a Tsarist general. Little does he know, he was picked out of a pile of prospective performers by the movie's director (William Powell, The Thin Man) because he is another expatriate, and back home, Sergius locked him in prison. The director wants to see what happened to the man who was so cruel to him. 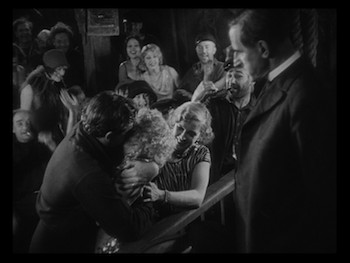 The trio of films in 3 Silent Classics by Josef von Sternberg are all full frame, black-and-white. Though far from spotless, the restoration done to these prints is still absolutely wonderful. All the prints have some scratching on them, though only The Last Command is persistent; the other two, the damage is intermittent. The images are clear, the photography has great balance between light and dark, and the resolution is fantastic. An extended round of applause would be well deserved. When you take into account how a couple of the films discussed in the extras are considered permanently lost, the fact that we have a way to preserve and watch this trio over and over is in itself a champion achievement. 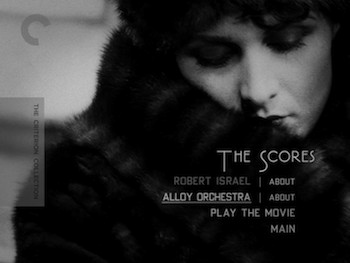 All three movies have two different musical scores to choose from. The one constant is Robert Israel, who provides a track for each. His music is dramatic, putting a full orchestra to use to achieve the full range of operatic emotions, as befitting von Sternberg's production. He also inserts some nice synchronized effects, such as ringing telephones and gunshots. (Interesting side note: his work on The Last Command is dedicated to Terry Gilliam.) On the other hand, the Alloy Orchestra, who provide pieces for both Underworld and The Last Command, despite using classical instruments, have a more modern sound, with synced melodies and a little bit of atonality. I quite liked their use of the accordion in The Last Command, it added a more authentic flavor to a lot of the scenes, such as the party on the train (which is then followed by a melancholy down-swell). On the other hand, I was not as fond of some of their percussive arrangements. 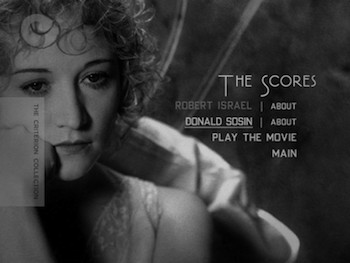 Donald Sosin provides the second score for The Docks of New York. His piano-driven music is fine, I suppose, but I didn't really care for the songs with vocals performed by Joanna Seaton. They were distracting and didn't fit the mood of the piece. I think in all cases, Robert Israel is really the way to go. The title cards look great. If they've been re-created in any way, they don't look it, they have a vintage appearance. 3 Silent Classics by Josef von Sternberg is handsomely packaged. The three movies each come in their own cardboard book, which fit inside a sturdy box alongside the thick collection of essays that go along with them. 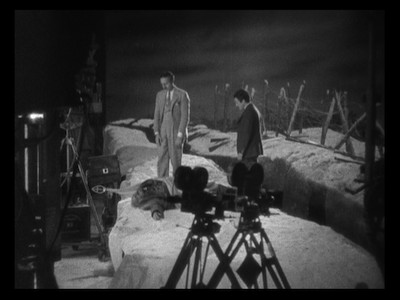 In addition to the standard critical essays for each movie, the 96-page book also has information about the scores, Ben Hecht's original (and quite different) story for Underworld, and a selection from von Sternberg's autobiography in which he writes about Emil Jannings. There are also cast and crew credits and photos. Chapter listings are on the inside front covers of the holder for each movie. Two of the movies have new video essays that use photos, artwork, and clips to dig deeper into the productions. 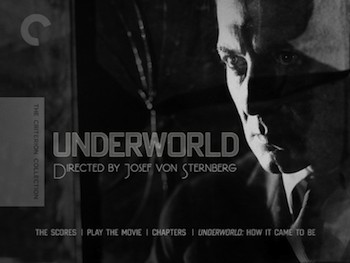 As mentioned above, UCLA's Janet Bergstrom has put together a 36-minute program on Underworld that begins with the long road to getting this opportunity and how von Sternberg took advantage of it. In addition to press photos and clips from the film, we also see poster art and some amazing production drawings. 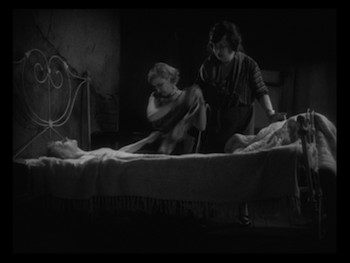 Bergstrom also shares clips from The Salvation Hunters and stills from the various troubled von Sternberg productions that followed it. 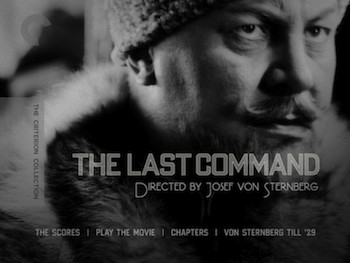 Tag Gallagher provides the second video essay, this time on the disc for The Last Command. Gallagher's video pieces are always really good, and this is no exception. His premise here is that von Sternberg had already developed most of his trademark style prior to his adopting sound in the next year and before even working with his regular co-conspirator, Marlene Dietrich. This 35-minute piece covers some of the same biographical ground as Bergstrom's, but its full focus encompasses all three movies in the boxed set. 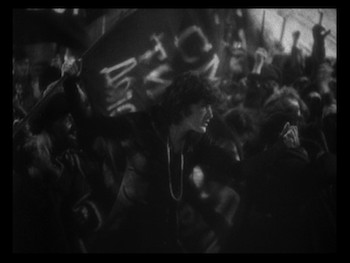 Scenes from von Stroheim's Greed used to show influences on von Sternberg's editing remind us how criminal it is that Greed is not yet on DVD. 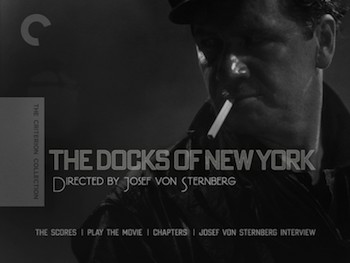 DVD 3, The Docks of New York, has a 40-minute interview with von Sternberg recorded for Swedish television in 1968. He spends an extensive amount of time talking about his silent films. 3 Silent Classics by Josef von Sternberg is one of my favorite boxed sets to come along this year. All the films are both engrossing to watch and to look at. 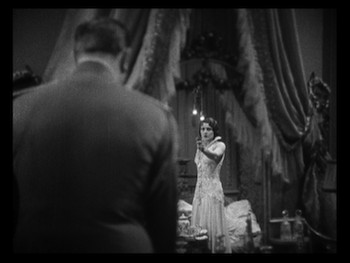 von Sternberg had an individualistic personality, and his vision shows in every frame. From the gangster chic of Underworld to the period war drama The Last Command and through the stark melodrama of The Docks of New York, he was developing his craft and establishing a style that was all his own. DVD Talk Collector Series.